April 16-20 is Week of the Young Child. Did you know that each of the nine counties West Central Initiative serves and White Earth Nation has a dedicated team of individuals and organizations with one goal to make this region the best place for its youngest residents to grow, learn and thrive? They are called the Early Childhood Initiative (ECI) coalitions. Led by an ECI coordinator, each coalition has brought together early childhood professionals, educators, parents, child care providers, health care, law enforcement and many more all for the sake of our youngest children and their families. This isn’t a new development. It’s been going on for 15 years, when the statewide Minnesota Early Childhood Initiative was formed as a network to ensure that every young child in Greater Minnesota has the best possible start toward a healthy life of learning, achieving and succeeding. The 10 ECI coordinators are contracted by West Central Initiative to work both within their communities and collaboratively. I call them “the Wonderful Women of West Central Minnesota,” and I mean it. 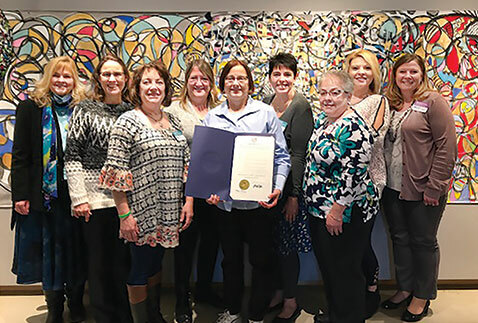 They have taken on challenging tasks with enthusiasm, and initiated bold, powerfully impactful projects, like the West Central Minnesota Early Childhood Dental Network, which now is being replicated throughout Greater Minnesota, and the West Central Minnesota Early Childhood Mental Health Network. All for the sake of making sure our littlest ones grow up physically, socially and emotionally ready for school and for life. The future of our nation rests on these tiny shoulders. Why wouldn’t we do whatever we can to prepare them for this tremendous responsibility? I hope if you see the ECI coordinator in your area, you’ll take a moment to thank her for the amazing work she has done for our young children. And while you’re at it, let ALL the people responsible for the care, education and well-being of our children know how much we appreciate the work they do. That’s what Week of the Young Child is all about!